Coffee Trail - Counting Stars, Reaching Delphi .✫*ﾟ･ﾟ｡.★.*｡･ﾟ✫*. : All Beered up to a GoALLLL!! Being a pre- iPad generation has its advantages, you actually know what a television box is, and for some, the television is regarded as a prominent family member that owns the rights to designated space in homes and comes with marked ‘do-not-move-me’ territory. Some of us also know how this black-and-white box had evolved in shape, size, look and form over the years, from its humble beginning of being just a big jumbo, perhaps a Philips, in the centre of the living room to the current hand-held versions that get lost so easily in our overstuffed hand bags and back packs. If you go back in time, to the mid-90, years before the Kardashians hit the mainstream, there was a popular show called Globe Trekker (The Lonely Planet). This is an adventure travel television series where I felt I was Aladdin on a magic carpet, observing from above, shouting to Ian – 'watch out for that greasy food', 'don’t jump into the freezing lake you eejit' and, 'are you sure you want to bungee jump?'. It was also through this series that I formed some of the items on my to-do list. One of these was to visit the fairyland castle which a young king known as Ludwig II of Bavaria, also known as the mad king or fairy tale king, built and lived in. Neuschwanstein Castle. Ludwig II was the closest living fairy tale king for me. I was charmed by his daringness to be different, his respect for art and music and I just had to see this great madness that history talks about for myself. According to history, Ludwigs II aimed to replicate medieval architecture, mainly the Romanesque, and to pay homage to the operas of Wagner. Wagner was his favourite composer, and well, that’s a name I recognise from learning music days too. First, stop Munich. 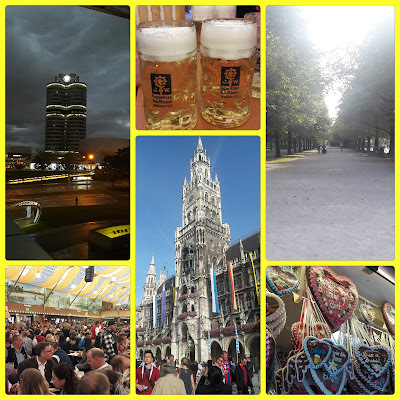 Munich is 560KM from Bonn or 400KM from Frankfurt, Munich is the largest city in Bavaria and third largest in Germany. The name is derived from the term Munichen which means “by the monks”. This dates back to the days when the monks of the Benedictine order who ran a monastery that later became the old town of Munich. Like its other rich European city counterparts, Munich also is home to numerous museums, theatres, and universities (we walked where Einstein once walked). It is also the home of the BMW head office and the widely celebrated Oktoberfest. Munich has an interesting history that goes beyond the cobble-paved walkways, great composers, breweries and the famous Rathaus-Glockenspiel, and I would highly recommend that you read about it before coming to Munich or join a walking tour like we did to appreciate the sights and flavour of its culture and people. And as for vegan food – there are plenty of options, we tried the cuisine from Bodhi before setting out for a treat to hear the music of a great composer, Vivaldi. In the end, Dirndl for this visit ✗, but for the next visit, a big ✔. Next. Football tickets ✔. Directions to the Allianz Arena ✔. 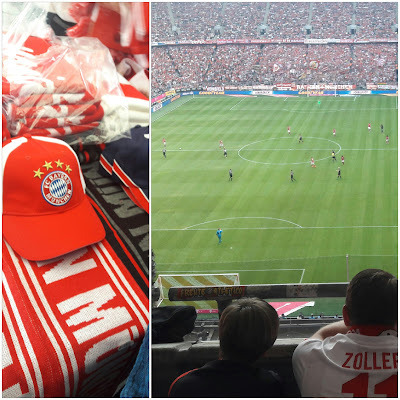 The teams playing were FC Bayern Munich and FC Koln. Both wore red. I was in blue, Es in white and since we were the only two non-German looking fans, we were forgiven for not wearing their colour. We sat with the visitors, cheering for Koln. They welcomed us instantly and even more when we told them we arrived from Bonn. FC Bayern Munich 1, then FC Koln 1, the first round of celebration beer thrown onto us in excitement. I read that in Europe, football could either unite, break or create walls and war. Being there I felt that intensity as I watched the passionate fans turn away when a free kick was awarded to the home team. Final score 1-1. We left happy together with the thousands who had their own versions of celebration. Finally, it’s time to visit the home of the famous king of Bavaria. But before that a stop for some coffee to fuel up. 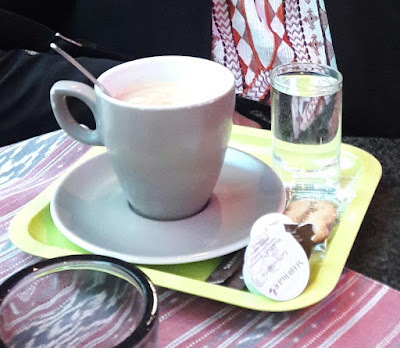 My coffee shot is one which we had very early in the morning at a quaint café located in Hotel Sonne in Fussen. 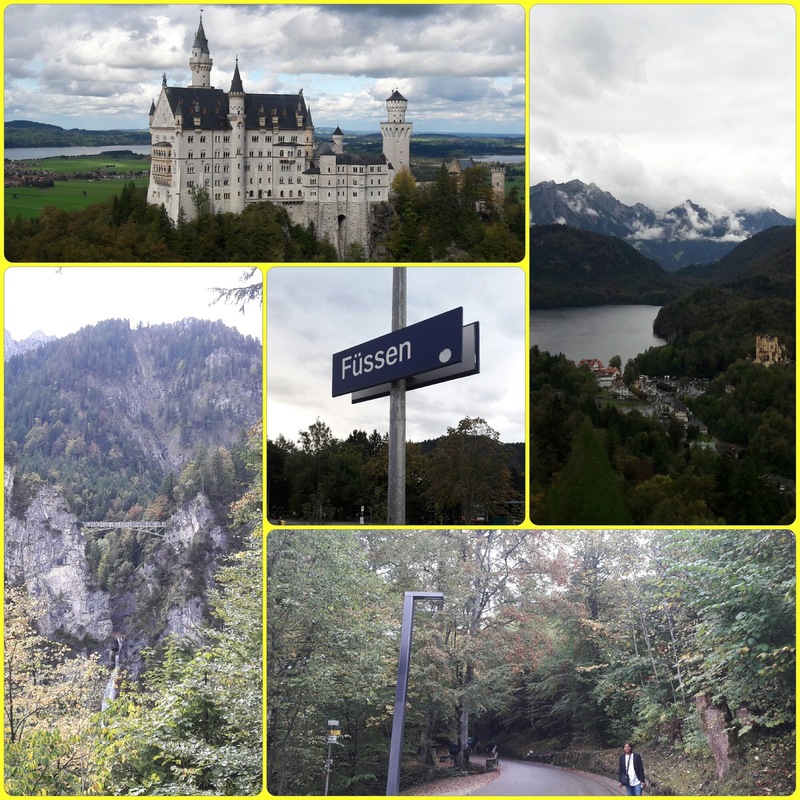 It was pretty much early, cold and wet when we arrived in Fussen (a small town approximately 130KM away from Munich). The city, at 6am, was still pretty much taking it easy for the moment. Though the hotel was serving only their in-house guests at that hour, the friendly manager on duty must have heard our recusant tummies growling loudly for a hot brew. We were served, and grandly I must say. The aroma was so stimulating that it refreshed us instantly. We would have stayed here longer for the warmth, but we had caught the local bus to the ticket centre in Hohenschwangau. Leave early and wear good non-slip pair of footwear because the uphill trek from Hohenschwangau to the fairy castle is a good 45-minutes one. For us it was on a wet path (it rained just before) with trails of horse poo that you’d need to watch out for. We tried racing against the horse-drawn-carriages, but the horses beat us flat. Walking, cycling or horse carriage rides are the only options to go to the castle. Get there even earlier if you want to take the carriage, the queues are long. Keep your cameras and handphones ready at all times, the sights and panoramic views get more breathtaking with each step uphill. 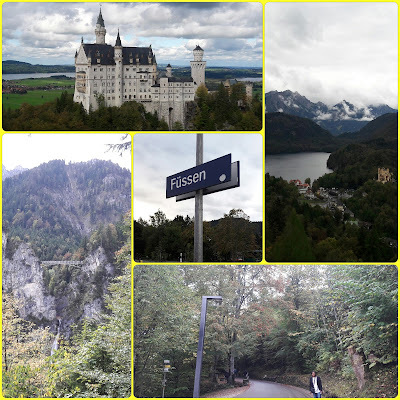 The Hohenschwangau Castle and lakes are some of the shots not to be missed from the top.